When it comes to pointe shoe fit and beautiful aesthetics, there can be a wide discrepancy in how a shoe looks while on pointe versus a flat or demi-pointe position. Satin fabric just doesn’t have the “give” to look smooth around the heels both on and off the platform. Those annoying heel crinkles are the bane of many a dancer and professional fitters as well. Bloch of Australia is now offering a possible solution to the problem; pointes that stretch. They have added two new models to their collection; the Eurostretch and the Dramatica. Manufactured several months ago, they began arriving in stores a few weeks ago. Bloch made the debut announcement June 12, 2014 on their Facebook page. Both of these models are created with a stretch satin heel area. There is a slight difference between the two as far as toe box configuration, wing construction and paste materials. As you can see in the images above, both are split sole shoes. 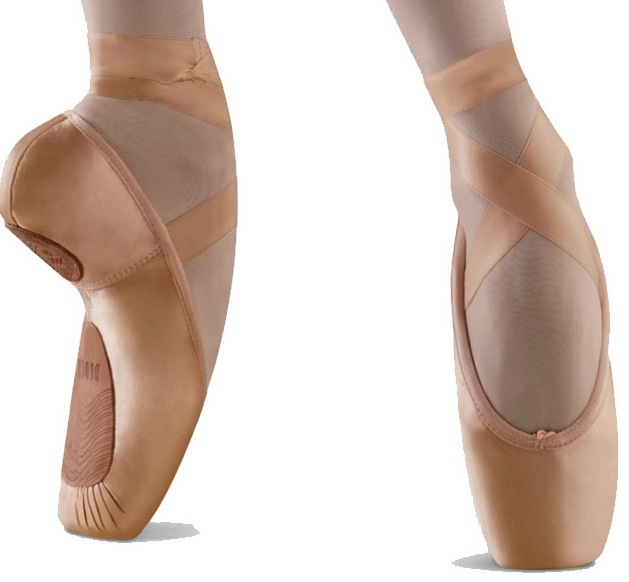 Because of the split sole construction, the models are recommended for students that have had several years of pointe training and have strong feet. Both models are manufactured using the European Balance last, or form. The Dramatica appears to have a more tapered toe box and slightly narrower platform. The shank construction of both models is very interesting. The shank is layered with the under-section going along the entire sole and the top shank layer split to allow the satin to stretch. You can read more about these new models on Blochshop.co.uk. To give credit where credit is due, I have to say that the concept of incorporating stretch into a pointe shoe heel is not new. Merlet of France thought of this idea when they created a half satin, half stretch-canvas model called the Kaliste years ago. You can read about the Kaliste on an old post from 2010. Is It Possible To Completely Remove Heel Wrinkles On Pointe? I don’t know. Our feet become so much shorter when we stand on our toes. We lose heel depth. I can’t be totally convinced that “wrinkledge” can be 100% wiped out by using stretchy material across the heels. There always seems to be a little bit of seam bulging out or a small air sac that protrudes on even the best-fitting pointe shoes. Maybe well-placed ribbons and /or elastics will make these types of shoes stick closer than what they appear to be doing in this photo. Doesn’t this heel look wrinkled to you? Although these new models are not yet featured on Bloch’s official website, it appears that dance supply shops across the country are now debuting these interesting shoes. New models mean waiting for all the dancer reviews to come in so we can find out whether they live up to the manufacturer’s claim. What you do think about Bloch’s newest shoes? This entry was posted in New Models 2014 and tagged Bloch Dramatica pointe shoes, Bloch Eurostretch pointe shoes, new pointe shoe models 2014, New pointes from Bloch 2014. Bookmark the permalink. omg !!!!! I wish these had been around when I was a ballet student – I love the way they fit. but on stage—everyone needs a similar sole construction or the visual effect is spoiled. I am all for improving the technical aspects of pointe shoes, but a corps de ballet needs a uniform look. if students get accustomed to an “unusual” construction, how will they function later on in a company? That’s a very valid point and good question, Dancer3502. Of-course if the group has decided they will go with a particular shoes then everyone will have to wear the exact same shoe else the Ballet is incomplete. 1. The box was too square on both models. Therefore this shoe is mainly suited to a slight semi taper or square foot. 2. The toe cushion made of foam in the platform is horrid and uncomfortable. 3. I tried on the narrowest width, X width and it still wasn’t narrow enough… I sank. 4. Even the guy who served me said they were not proving to be popular and they are unsure how long they will stock them for. 5. The profile height of the shoe was quite high.. more on the medium side of high so again, only suited for a very medium height or high profile foot. I love my bloch Eurostretch! Over the course of my career, I have tried a multitude of pointe shoes. For Bloch, this includes- Serenade, European Balance, Jetstream, and Heritage. I’ve found the Eurostretch to be terrific for repetoires that require a lot of work up on the platform. 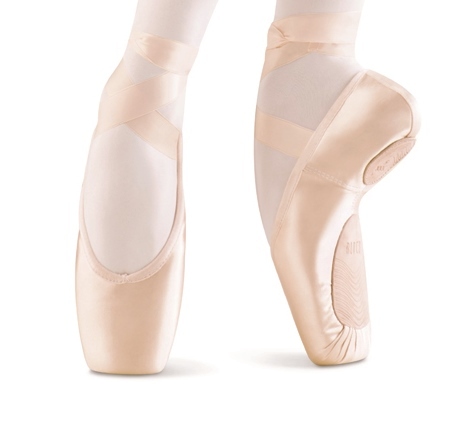 They are comfortable, form to my foot, and allow my feet to have a beautiful shape en pointe, which I could only find with sleeker shoes (like Russians which just weren’t quite right). I can balance great in these and the longevity is pretty good. Wish they were cheaper! I have a strong square foot, toes of the same length and very short, widest at the metatarsal, flexible arch, medium profile. I also wear the Heritage for contemporary works, a very different feeling shoe. I would NOT recommend the Eurostretch shoe for narrow feet or tapered toes, someone that needs a narrow box, or for a beginner. I haven’t tried them on, but I would think the Dramtica would be better suited for someone with narrow feet and tapered toes that wants a shoe like this.